The Boston Landmarks Orchestra’s 2013 summer season at the historic Hatch Shell on Boston’s Esplanade begins on July 17th and will run Wednesday nights through August 28th. The season opens with At the River, a new work by Northeastern University’s Anthony De Ritis in a program paying tribute to city, state, and national parks. The concert features LO concertmaster Gregory Vitale as soloist and is part of Boston’s inaugural Outside the Box Festival. During week two, the LO performs alongside the celebrated Conservatory Lab Charter School’s Dudamel Orchestra in a newly commissioned work by Michael Gandolfi, Composition Department Chair at the New England Conservatory. An educational edition of this program took place on May 24 at the Strand Theatre in Dorchester. On July 31st, salsa musicians join the LO in “A Night in the Tropics,” a concert inspired by Latin American music and dance. Additional partnerships include two perennial favorites: Boston Lyric Opera and the medical community’s Longwood Symphony, presented by the LO as a guest orchestra. The summer concludes with two major collaborative projects. Commonwealth Shakespeare Company teams up with LO in a concert version of Cole Porter’s Kiss Me Kate, based on Shakespeare’s “The Taming of the Shrew.” Then on August 28th, the 50th anniversary to the day of Dr. Martin Luther King Jr.’s “I Have a Dream” speech, artists, schools, and organizations from throughout the region celebrate one of the greatest orations in American history. Music, imagery, the spoken word, a musical setting of the speech, and a performance of Aaron Copland’s A Lincoln Portrait make a stirring tribute to King and his vision. Lee Eiseman: Your opening concert, “At the River” reminds me of last season’s opener, which began so movingly with Bob Honeysucker’s splendid performance of Shall We Gather at the River? Did that performance inspire this year’s opener? Christopher Wilkins: Yes. We’ve commissioned a new setting of the beautiful 19th-century hymn, which speaks so movingly about the river flowing through the great city and by the throne of God. It’s become something of an unofficial anthem for us. The Copland version is famous for good reason, but we wanted to have a new setting. So we approached Anthony De Riti, chair of the music department at Northeastern, and proposed that he write something for soprano Myran Parker-Brass, whom I’ve known for, gosh, probably 20 years, initially in her former capacity as director of education at the Boston Symphony. Now she’s executive director for the arts of the Boston Public Schools. Myran’s a wonderful singer and is also cofounder of the New England Spiritual Ensemble, who join us in the closing concert of the summer as well. So that makes a nice frame. Anthony has known Myran too for many years, and responded with great enthusiasm to the idea. OK. And I can see how you go from there to Vaughan Williams’s A Lark Ascending, but then how do you get people in the mood for Johann Strauss after that? Celebrating the environment is part of an annual tradition Charles Ansbacher started and called the Green Concert. As you know, part of the original idea for the Boston Landmarks Orchestra was that music and venue can have a wonderfully mutual beneficial effect. This was a very Charles idea, and it’s built into our name. It is part of Charles’ larger vision of using art to support the welfare of a community. And so this year’s Green Concert is dedicated to our city, state, and national parks, and a great many of them will be represented on the oval. Of course, we’re playing in a state park, and it’s impossible to sit there on the Esplanade and not think of Frederick Olmsted and the Emerald Necklace and the beautiful green spaces that are part of what make Boston such a great place to live. 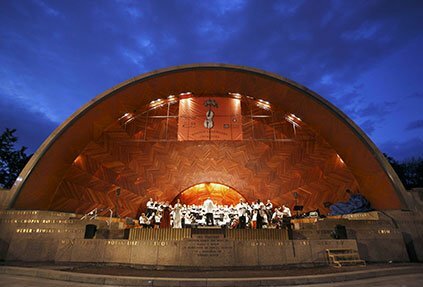 Tales from the Vienna Woods is part of the same tradition that gave rise to the Hatch Shell and to Arthur Fiedler’s presence on the Esplanade so many years ago. It was premiered by Johann Strauss Jr. in the Vienna Volksgarten, a public outdoor space not so different from our setting. Don’t you think that musically, going from The Lark Ascending, which is very poignant, to something like the Strauss is going to be a stretch; but maybe there’s an intermission at that point. There’s an intermission after the Strauss. The Strauss is a logical concluding work to a half, I think; it’s very tuneful and pleasurable, as is the Vaughan Williams, but as you point out, in very different ways. The Vaughan Williams is very poignant and very sublime, where the Strauss is obviously much more earthy. Then right after intermission we do the Beethoven Pastoral. We are also proud that this concert is part of Boston’s new free outdoor festival, Ted Cutler’s Outside the Box Festival, which is taking place July 12th through 21st. What’s the state of the sound system going to be this year? Well, last year for the first time, we employed Steve Colby, who is the genius anywhere for outdoor sound engineering. He does that for the Pops, and has done it for leading artists all over the country. He was on tour this year with Barbara Streisand—we just have the absolute best guy on the job. We now import our equipment, working with our longterm partners at MJ Audio rather than using the in-house system, just because the in-house system is, most would acknowledge, not in the best condition. Tell us about the unusual concert that follows on the 24th. The key here is the collaboration with the Conservatory Lab Charter School and the commissioned work by Michael Gandolfi, which is essentially a tone poem for double orchestra. Michael brought the kids at CLCS — their Dudamel Orchestra — into the creative process at every stage. They were involved in choosing themes, the storyline, the musical form and so forth. He also invited those with a particular interest in composition to his home studio to show them how he orchestrates, how he sets things up with regard to the computer software, etc. Several of our musicians participated by serving in residencies at the school, and have formed some wonderful bonds with those students. Our brass players, for example, have invited the school’s brass students to join them for a 6 pm concert on July 10 at Paul Revere Park in Charlestown. We wanted to design a whole program that would be family-friendly and serve as an introduction to the orchestra. So on the first half the CLCS orchestra performs, on their own, music from Howard Shore’s score to The Lord of the Rings. The Landmarks Orchestra performs two works featuring the families of the orchestra, Strauss’s Perpetuum mobile and Britten’s Young Person’s Guide to the Orchestra, and then the Brahms Symphony no. 1 closes the program. The CLCS orchestra also worked on the Brahms piece this spring, though in this case it will be the Landmarks Orchestra performing it alone. So is the Gandolfi structured in a way that much of the time you’re hearing contrasts between the two orchestras? It has a really interesting structure. It is built on two ideas. The first is a narrative, created out of imagery from two Tarot cards. Thus the title of the piece: The Queen and the Conjurer. The second device they used is theme and variations, as in the Britten. The CLCS orchestra plays the theme at the outset, which represents the character of the queen. But the portion that’s played by the kids doesn’t develop? It’s reiterated every time? It is affected by the spells, so it does change, but it retains its original character and its original simplicity. The conjurer is the one who casts the spells, changing that theme, and thereby creating the variations. You hear it generally from the Landmarks Orchestra with variations that are more virtuosic than the theme. I mean, the challenge was how do you write for two groups of vastly different technical abilities? And this was their ingenious solution. Is there a finale where everybody’s playing together? Actually both groups are playing together a lot of the time. In reality, it’s not simply an alternation back and forth but a full-on combination of the two. My hope is that the kids will be downstage, closer to the audience, and the Landmarks will be upstage. That will make the kids more visible. That all sounds very interesting. Now thereafter in your calendar, there’s no conventional symphonic repertoire, although at least there is a symphony, or something like a symphony, by Gottschalk. As a New Orleanian, I have a special fondness for that composer. He was a bit of a gumbo all in himself. Yep, his A Night in the Tropics is remarkable considering when it was written—it’s the godfather of modern crossover music, and think about what he was doing in that day and age, how long it took for later generations of composers to do some of those things. Now when you say this concert’s featuring Latino musicians, tell us something about your partner organization, IBA — Inquilinos Boricuas en Acción. This is a continuation of a partnership we established last summer. 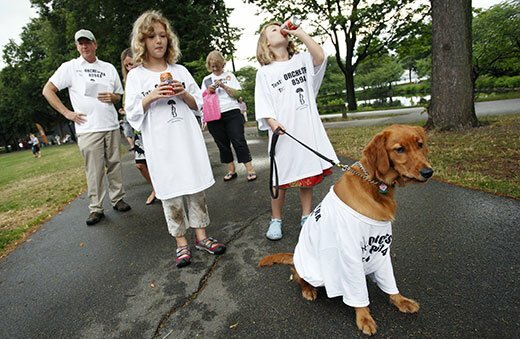 Unfortunately last summer’s program got rained out at the Hatch Shell. We did manage to do it the following night in Blackstone Square in the South End, which was a remarkable community event. A terrific musician by the name of Alex Alvear is assembling a group of musicians who play Latino popular music and jazz around Boston. They are fantastic, many of them faculty at Berkley and NEC and so forth. Alex was for many years the music director at Villa Victoria, the cultural arm of IBA, which was originally established as a housing development in the 1960s for Puerto Rican families. It’s in the South End right off Tremont Street. IBA has grown enormously over the years, becoming more diverse over time and expanding into cultural offerings as well. They have a preschool, they offer extensive programs in dance, music, theater, and they have a cultural facility in a renovated church. The first half of our concert features famous orchestral music by Latin American composers — I include Gottschalk in that description, as his A Night in the Tropics premiered in the Caribbean in a monster concert featuring 650 performers. Then the second half of the concert is given over to our collaboration with these great performers of Latin popular music. It is another Landmarks-commissioned work, and the composer is the Venezuelan Gonzalo Grau. Gonzalo has been active in the Boston musical community as a performer and composer for several years. What is essential here is that Gonzalo walks comfortably in both worlds. He grew up living and breathing orchestral music, but also has Latin jazz in his bones and knows firsthand the folkloric traditions of many Latin American cultures. His interest is in preserving as much possible the real sound of popular music, not the “processed foods” approach of so many orchestral arrangements of Latin music. And he’s done a remarkable job—we really enjoy playing it because it stretches us. It’s a whole different way of looking at rhythm especially. I remember we were talking about that last year, that there was something that really had to swing that you guys were working on. It’s wonderful fun and makes just a really exciting sound. We also have invited dancers to perform with us and they are essential, full collaborators in the performance. Gonzalo’s piece is called Viaje, meaning journey. It’s a voyage through four different Latin American cultures: Cuba, Colombia, the Dominican Republic and Puerto Rico. Every Latino and Latina knows how to dance and you just can’t present this music without including the movement, which will make a gorgeous visual impact at the Hatch. I do my best, but it’s a humbling experience. Next, the Boston Lyric Opera, is it going to offer a potpourri concert? It’s sort of a preview of their season. They’re doing a fair amount of The Magic Flute, previewing the opening of their 2013-14 season, plus celebrating the birthday boys this year: Verdi, Wagner, and Britten. What are the connections among BLO, and Longwood Symphony, and the Landmarks Orchestra? We’ve presented both organizations for many seasons. For the BLO, it’s the Landmarks Orchestra on stage, though many musicians play in both ensembles. And of course we share the same initials, which can sometimes add to the confusion. 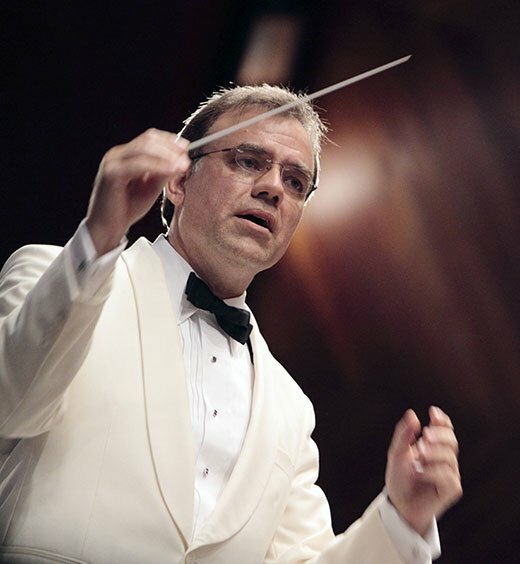 But the Lyric Opera makes the selection of the music and their music director, David Angus, will conduct. In the case of Longwood, it is their musicians; we are the presenter. I think we’ve hosted Longwood every year since we’ve been at the Hatch Shell. The mission of the Longwood Symphony is similar to ours in that it is very much about service to community, so it fits well on our series. That concert includes the longstanding collaboration with the Chinese Foundation for the Arts, who sponsor a piano competition each year. The winner performs with the orchestra on this concert. The two main organizational leaders, Catherine Chan of the Foundation and Lisa Wong of the orchestra, come up with incredible talent year after year [e.g., see review here]. Then we hear Cole Porter’s Kiss Me Kate. This will be the first musical I’ve done with Landmarks, though Charles Ansbacher conducted the orchestra in a memorable South Pacific some years ago out in front of the USS Cassin Young, a WWII destroyer moored at the Charlestown Navy Yard. Your Kiss Me Kate is billed as a semistaged, meaning some blocking? I assume you’re not going to set up a square in Verona within the Hatch Shell. This is really going to be a concert production. We will have some costuming. But to call it semistaged might be promising a little more than we can deliver this year, so I prefer call it a concert performance, or perhaps concert staging, and we’ll see what ends up being possible. The players will interact with one another, there will be some blocking, and happily, a good amount of dance choreographed by Yo-el Cassell of the Boston Ballet School. We had such a great time working with Steve Maler and Associate Artistic Director Adam Sanders last year on our Shakespeare concert. Kiss Me Kate takes it to another level in offering a full evening of a single masterpiece. It’s a great musical, and Broadway’s greatest adaptation of Shakespeare. We just love working with this company; they’ve been really great partners. And how is it that their company has singers in it then? They don’t have a set company. There are many actors who perform for them on a regular basis, but for every production they assemble a unique cast. We’ve done the same for this production. We conducted several days of auditions this spring, both for the main roles and for the company. This included acting, singing and dancing auditions. In a sense. It was completely open. We worked closely with Boston Conservatory, and put out the word across the community. The cast needs to be skilled in all three areas: acting, singing and dancing. The show includes passages from The Taming of the Shrew and the music is sophisticated stuff. So the demands are intense. But we are thrilled with the cast we’ve put together, and it definitely says something about Boston that that level of talent is readily available here. So these are conservatory students for the most part? A lot of the ensemble are young, yes. Are there recognizable names that we’re going to see in the cast. Then we come to the last event, which is a civil rights concert—just as the key part of Voting Rights Act has been declared unconstitutional, we have this anniversary of the “I Have a Dream” speech. It may be the greatest of all American speeches, and part of its greatness comes the richness of its allusions. The speech makes reference to the Declaration of Independence, to scripture and the psalms, to Shakespeare and Jefferson, to the spirituals and the song “America,” and of course it was delivered at the Lincoln Memorial in the centennial year of the Emancipation Proclamation. A lot of elements come together in the speech and our concert reflects many of them. The vision of the speech is timeless and supersedes ideas of nationality. So when we perform Kurt Weill’s Cry, the Beloved Country adaptation, based on the Alan Paton’s South African novel, it’s a recognition that issues of justice and social responsibility are for all people at all times. In the novel, the man who’s murdered was an admirer of the speeches of Lincoln. Lincoln’s arguments play an important role in the novel, and of course the King speech quotes Lincoln and was given at the Lincoln Memorial. We also will also perform spirituals, which were an important reference point for the style of Kurt Weill’s work, which when it went to Broadway was called Lost in the Stars. But the spirituals were also very important on King’s marches. And interestingly Tippet uses spirituals in A Child of Our Time, in some ways, I think precisely to take the audience out of the time and place, to make it universal. As we did for last year’s opening concert, we will assemble our One City Choir for this one, drawing on volunteer singers from all across the community. So there’s just a lot going on in this program. We are privileged to partner with the Museum of African American History, also the New England Spiritual Ensemble, and Philip Lima, who will sing the beautiful Lee Hoiby setting of the speech. We will have a famous and prominent person narrating both the Weill and the Lincoln Portrait—name yet to be revealed. One clarification—the Kurt Weill Cry, the Beloved Country used to be Lost in the Stars and then the title changed? Which is a good song on its own. It is a beautiful song. And it’s really the only song for the main character, which Robert Honeysucker sang here, beautifully, 25 years ago with the Boston Opera Company. But we are doing a concert version created by composer and musicologist David Drew that doesn’t include it. Drew wanted to create a concert version of the piece and, in doing so, to go back to what he felt was Weill’s original intention to stick closer to the novel. Drew took out “Lost in the Stars,” and revised the made-for-Broadway ending. And it’s his version we’re doing, along with readings from several passages of the novel, by permission of the Paton estate. Well, we’re looking forward to seeing who’s going to narrate the Lincoln Portrait. And will that same person read the entire “I Have a Dream” speech? No. Said person-of-note will narrate Cry, the Beloved Country and the Lincoln Portrait. The “I Have a Dream” speech — the last half of it, beginning with the words “I have a dream” — will be presented only in song, as set by American composer Lee Hoiby, who was known mostly for his operas and who recently died. The notable baritone Philip Lima will be singing the setting of the speech. What will really fascinate people is the projection of some spectacular photography during the Lincoln Portrait. Photographer James Westwater has worked with orchestras over many years to combine photography and music in an art form he calls photochoreography. Most of the images are taken from Lincoln’s time, the famous Civil War images of the Mathew Brady studio for instance. But toward the end of the music, the photographs turn to the civil rights era, and conclude with images of King delivering the speech at the Lincoln Memorial. It’s chilling. You’re going to busy at venues other than the Hatch Shell this summer. We have chamber groups who will perform all around town – I have mentioned already the Charlestown concert on July 10th. We will offer our annual concert at the Pinebank Promontory in Jamaica Plain on Sunday, July 14th. And we are pleased once again to be participating with WGBH in their Summer Arts Weekend, to be held again in Copley Square. Our performance will be an interesting one, as it will feature the Galician bagpiper Carlos Nuñez. He is a star in the Celtic world, hailing from northwest Spain, with its rich history of Celtic culture. I want to say too that we are all very pleased with our “Breaking Down Barriers” initiative. It’s a program designed to make everything we do approachable to those with disabilities. We have a fabulous team of folks who help us make our programs accessible to the blind, the deaf and hard of hearing, and those with barriers to physical access. It’s a very important part of what we do, and it’s intrinsically tied to our mission of inclusion and accessibility for all. OK, best possible option: that it rains on August 7th, and the Landmark/BLO concert is moved to the indoor site. And can I believe my eyes: Sandra Piques-Eddy is appearing with the ensemble? I love SP-E! (Joke: what does Wotan say when HE’S amazed by something? “I can’t believe my eye!”.